Shop our vehicle inspection mirror to allow enhanced visibility for under vehicle searches as well as underneath machinery, industrial equipment, buses, etc., while maintaining an upright position. The lighted inspection mirror models have a removable flashlight that improves visibility in low light conditions. All under vehicle inspection mirror models come with an adjustable inspection mirror that can be swiveled and locked securely into place. The mini inspection mirror has an 8" fixed convex glass lens. The extendable inspection mirror models can be ordered with a 12" acrylic convex inspection mirror or flat mirror. Extendable inspection mirror handle adjusts from 33"-45"
Shop our vehicle inspection mirror which is handcrafted with precision and care in The Unites States constructed of materials originated in the USA. 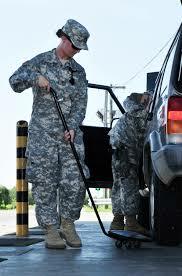 Our comprehensive line of inspection mirrors is GSA approved. Brossard inspection mirrors are the favored security inspection mirror by the US military, Border Patrol, TSA, DOT checkpoints and other federal as well as local governmental agencies. All models are equipped with telescoping handles and are available with heavy duty ball bearing caster wheels, flashlight, and choice of a 12” convex mirror or flat mirror We maintain high inventory levels with quantity discounts available. Orders ship in 1 business day and expedited shipping options available. Made in the USA & GSA approved. Under carriage inspection mirrors are commonplace in the automotive and transportation industries to examine vehicles and trailers in order identify components needing repair and parts requiring replacement. State automotive and vehicle emissions inspection stations prefer the models with lights and wheels. 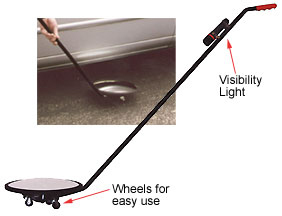 With these options, users can easily roll the mirrors underneath cars and the lights will illuminate dark areas. It is not uncommon for truckers to stow an inspection mirror in the cab of their rig in order to perform roadside inspections. Given the recent events that have unfolded in our nation's schools, educational facilities, hospitals, public events and theaters, the use of vehicle inspection mirrors have expanded into searches for weapons and other devices not permitted on premises. Administrators and personnel are able to check hard to see areas for articles of suspicion and thwart unwanted activity before it happens. The mini inspection mirror is particularly user-friendly as the compact design of the 8” mirror and 40” fixed handle allows for use in confined areas. Hospitals and hotels able inspect under beds, chairs, furniture, and heavy or immobile equipment addressing potentially hidden items of concern. The food service industry is able to rely on an inspection mirror to review food prep areas, storage areas, and cooking equipment for signs of bugs, rodents or other undesirables where they could run the risk of costly violations from the health inspector. Generally the model of choice is the inspection mirror with a 12” flat lens. This will provide the most clearance underneath the tight areas in the kitchen. Industrial and production facilities use the Brossard inspection mirrors to survey heavy equipment, machinery and assembly lines to make sure vital instruments are operational. Potential problems can be solved before catastrophic failures occur. The mirrors are durable yet light weight enough for use all day without discomfort.